Guitar Blog: Why measuring your practice makes all the difference. Why measuring your practice makes all the difference. 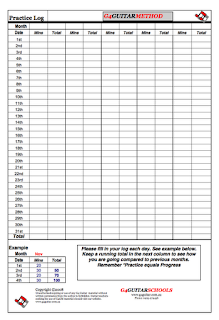 Whenever a new student would begin lessons I would spend a portion of the first lesson asking them to fill in a daily practice log. Now most were happy to go along with my request but not all. Some students would feel it unnecessary, pointless or even over the top. Comments like "Guitar is just a hobby" or "Don't worry, I will be practicing" were standard from those students not wishing to participate. The problem unfortunately was that over the years my research showed that it was those exact students who were most likely to quit or complain that they didn't have enough time. Studies have shown that we humans tend to over state our ability to get things done. I remember reading how the Sydney Opera House went many times over budget and took years longer than expected to complete. Another example is most people think they are of above average intelligence, are better than average drivers and even believe we will liver longer than most of our friends. The fact is we can't all be above average. Now guitar is no different. When learning guitar we tend to over estimate the amount of practice we really do. For example a student might commit to practicing 30 mins a day. After 3 months they assume they have done 90x 30 mins being 45 hours. That would be enough focused practice to play some basic Beatles songs. The reality though is that the student will likely have missed a few days each week and in some cases missed a complete week and end up practicing half as much as they realise. We see this all the time with people trying to get fit or perhaps save money. They don't track the exercise or money spent so are left scratching their heads. The reason the practice log is so powerful is because it challenges the student to be honest. If at the end of every practice session you log in your practice times you will not be able to mislead yourself. It's a daily reality check. The practice log has additional psychological benefits as I discovered. When we measure we feel compelled to improve on our previous scores. So if you did 900 mins practice in your first month you will naturally aim to do better the next month. If your practice drops in the next month you will almost feel obligated to make up the lost time in the following month. I found that students became a lot more consisted once I introduced the practice log and student dropouts reduced dramatically. It only takes a few seconds at the end of each practice yet it makes a dramatic difference to most students. 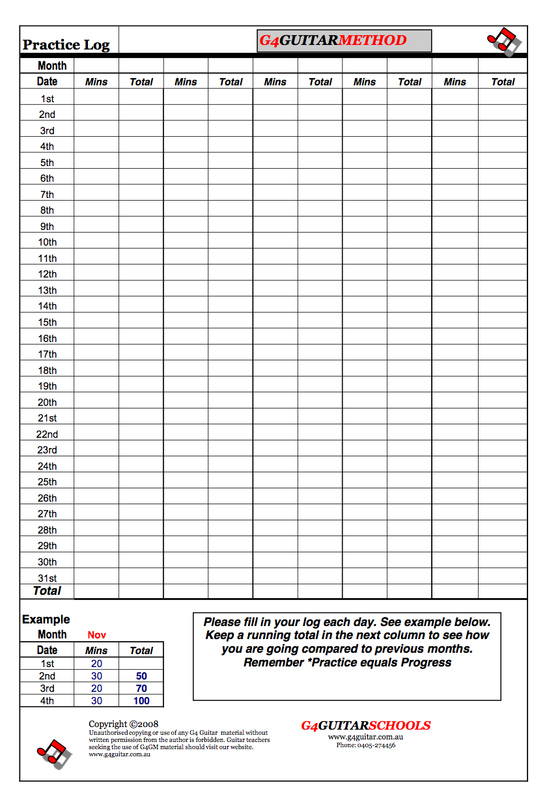 Log your practice because your efforts deserved to be recorded. Acknowledging your efforts builds confidence.